ATLANTA (AP) — Flush with cash, the New York Yankees may take a run at Manny Machado. 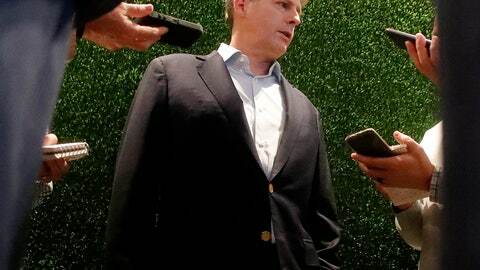 Arriving in Atlanta for two days of owners meetings at a hotel next to the Braves’ SunTrust Park, Hal Steinbrenner discussed the state of a team that has one of baseball’s most dynamic young rosters but came up short in the playoffs the last two seasons. The Yankees owner has plenty of money to spend after coming in under the luxury tax threshold last season for the first time since the penalty took effect in 2003. While the top priority is starting pitching, New York is also mentioned as a contender for one of the winter’s biggest free-agent prizes. Machado is a dynamic player but comes with plenty of baggage, including the reputation as a dirty player and his admission that he’s “not the type of player that’s going to be Johnny Hustle ” after he jogged out a groundball during the NL Championship Series. Machado doesn’t seem to be a priority. Mimicking Cashman’s recent comments at the general manager meetings in California , Steinbrenner said the shaky starting pitching must be addressed. Steinbrenner didn’t rule out another huge contract. The Yankees already have Giancarlo Stanton , who is guaranteed $270 million over the next decade unless he opts out of the deal following the 2020 season. Machado is likely to seek an even bigger deal. — The Yankees owner declined to comment on his team’s plans to buy back the 80 percent stake in the YES Network sold to 21st Century Fox from 2012-14. Steinbrenner did indicate new investors likely would own a majority stake in the network, while the team retained control over content and presentation. It had a similar arrangement with Fox.